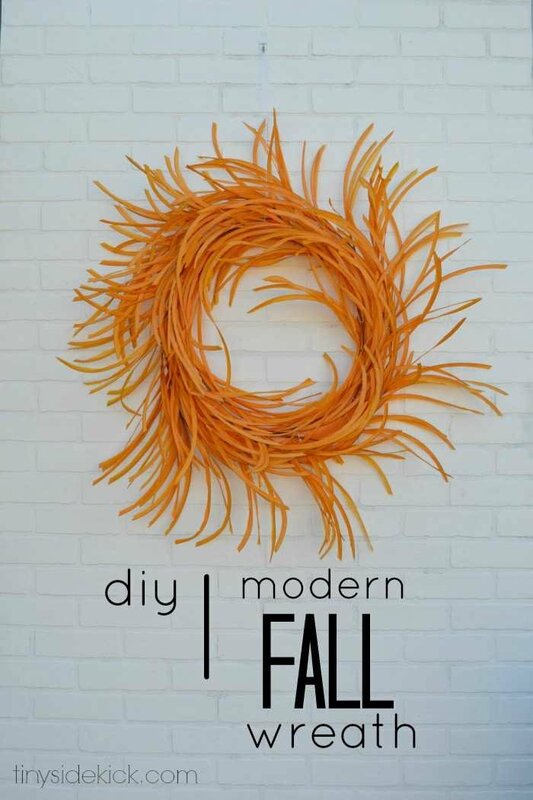 Inside: An easy fall wreath that will add a modern touch of fall to your home decor. Let me be the first to tell you that you won’t see too much traditional fall decor going on around here. Don’t get me wrong, I love the warmth of the season, but I like to do it in a little different way so that it goes with the style of my home. And because my style tends to be a little bit on the modern side and my home has a lot of blues and grays, I decided to go with bold pops of orange to incorporate fall into my home. So I hope you’re ready! I’ve got a lot of fall home decor projects on my to do list and an amazing fall home tour on the calendar too! 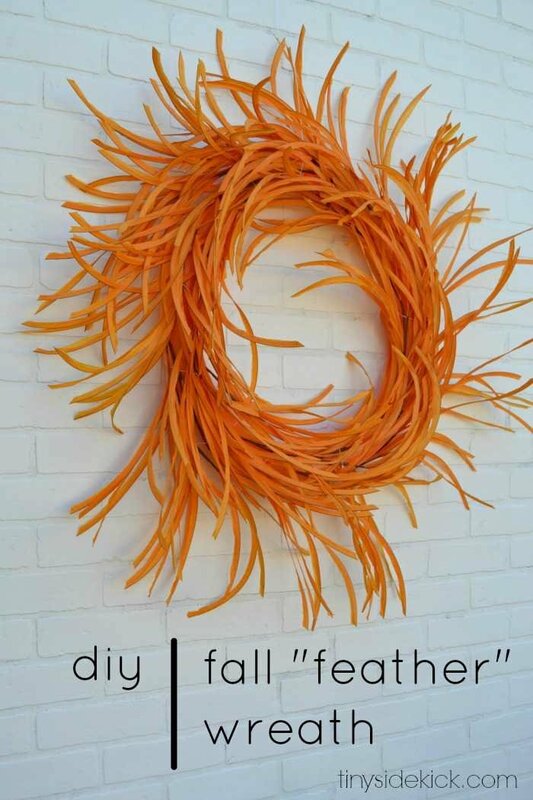 Let’s start off with this super fun “feather” fall wreath that isn’t really even made of feathers! This will take you less than an hour and add so much color to your space for fall! fake fall leaves. I got mine at Hobby Lobby at 40% off, but I’ve seen similar ones at other craft stores. Just look for long leaves in a color you love. They will act as your feathers. Step 1: Make your wreath form out of a pool noodle by holding the 2 ends together and securing with duct tape. Step 2: Take apart your leaf bundles by cutting them into smaller bunches with your wire cutters. I used 4 bundles per wreath. Step 3: Start poking your leaf bunches into the pool noodle going in the same direction. In order to get the right placement, lay your leaves on the pool noodle where you want them to end up, then poke the stem in. I had to play around with mine a few times, and fill in the gaps at the end to make it all even. Step 4: Once you have all of your leaves poked in, you will need to secure the branches onto the pool noodle so that they lay a bit closer to the wreath form. The end result should be airy and borderline “messy” but you don’t want any branches hanging. To start the string, tie it around the pool noodle and one branch. Then take your string and wrap it around and around, each time securing the branch portion of the leaf bundles, but pulling the leaves free. Tie it off at the end. Once I was done, I hung mine in my front window, which just solidified the fact that this bright orange is going to be the perfect color to add fall to my home this year! I had a few small bunches of leaves left over that I filled in the gaps with once they were hung, especially near the top to hide the tape. I just love how fun these are and they are a perfect modern take on a fall leaf wreath don’t you think? I LOVE this! So easy, and cute! Thanks for linking it up. Pinning to our Monday Funday board! I absolutely LOVE this! It is so fun and creative! Looks great! I love that it’s three dimensional so it looks good from every side. Thanks for linking up to The DIYers! This is super cute Corey and totally creative! I love it! Love this. So fun. What a great way to start out fall! So cool and looks amazing! Thanks for sharing at the Twirl & Take a Bow Party! I’m pinning to our party board. Have a great week! Thanks Aniko! I love fall too, but it is hard here cause it doesn’t even get chilly till it is time for winter decor so I keep my fall decor pretty bright and light! This is super cute. I love how modern and fresh it is. Pinning! Love this so much! I’ve been dying to try the pool noodle wreath trick. Yours looks awesome! Thanks Megan. It was so easy and I love that it is cheaper and ends up making the wreath so incredibly light! This is so neat! I totally thought it was feathers when I first saw the picture! I can’t wait to see the rest of your fall projects! So fun and I can’t believe fall decor is happening, but I’m a little bit excited for it! Great wreath, pinning. Love this idea! It’s inspiring, easy and modern but warm. Well, that wreath is just plan awesome! Funky and fun!